Visiting Japan and want to try some unique foods? Instant yakisoba noodles should definitely be on your list of food items to try. This is one food you can easily afford, find and enjoy, just about anywhere in Japan. As Japan has so many conveniences, when ever you feel like a bite to eat, all you have to do is to find the nearest convenience store, brands like Family Mart, Sunkus, Daily Yamazaki, Lawson, many are open twenty four hours a day. Yakisoba is a well loved food in Japan, and can be eaten fresh as a food stall item at many festivals, station kiosks and food stores such as supermarkets. What makes instant yakisoba noodles such a treat is that you can find it yourself at a convenience store with no language skills by just looking for the pack in the noodle section. They are a large Styrofoam bowl with a colourful lid showing a picture of the product, thin noodles in a dark brown sauce with nori seaweed sprinkled on them. At convenience stores in Japan you get to experience real Japanese convenience. In Japan, convenience store has microwaves, a constant supply of hot water in kettles, chopticks, serviettes, toilets,etc. 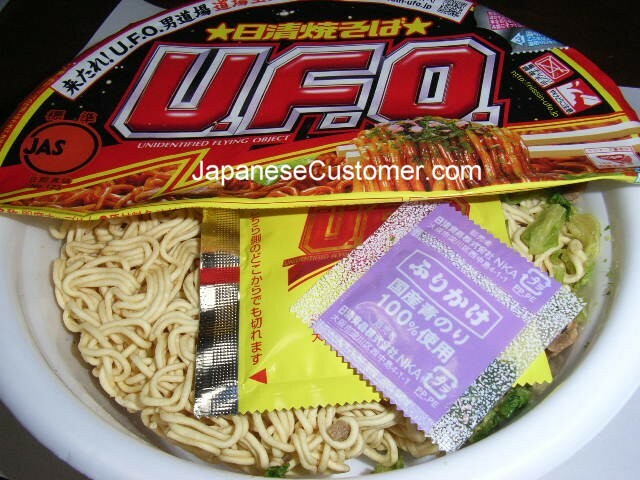 So what is so great about Yakisoba instant noodles? For me, its the taste, which is a mixture of a thick rich sauce, tangy ginger, the tenderness of the noodles and the overall smell, that is very unique. Step 1. You peel back the foil lid and also peel back the drainage vent , a small panel on the lid. Step 2. Take out the sachets enclosed and then pour in hot water from the kettle in-store and fill the Styrofoam bowl up to the line indented on the inside which is generally about halfway. Step 3. Re-peal the folded lid back over the bowl and re-seal by tucking the lid under the bowls edge and wait for three minutes to pass (a great time to check out some Manga magazines for the latest news). Step 4. When the time has elapsed, you drain the hot water from the bowl by the small vent, being careful to hold the bowl tight and avoid any hot steam. Step 5. Then you start opening the variety of sachets and adding them individually into the bowl. The store assistant will give you a set of disposable chopsticks (waribashi) when you pay and it is now time to open these, split them apart and use them to stir the noodles and contents of the sachets. Step 6. Re-seal the lid, tidy up the bench by disposing of all rubbish in the bin and then take the bowl outside with your chopsticks and find a nice seat outside to enjoy your meal. Yakisoba instant noodles are a cheap snack or meal that take about 5 minutes to prepare and are very affordable at about 150 yen (AUD $1.62). Plus you get to experience the fantastic convenience of making the noodles yourself in-store. Just like the locals do it. In the next post I will further detail the myriad of amazing services that Japanese conveniences stores provide for customers.